Are you looking for Propane Refill For Propane Heater in NJ? Modern Propane has been providing Propane Refill For Propane Heater in NJ since 1969, with excellent service and great customer care. Modern Propane is a propane refill station as well as a BBQ products super store with two locations in New Jersey. When you need Propane Refill For Propane Heater in NJ, Modern Propane will take care of your needs. We have a parking lot with easy access for larger vehicles so you can easily park your car right next to the propane refill system. We can fill up a variety of propane tank sizes, from 20 lb to 100 lb, so you know we can fill up yours and for a great price. 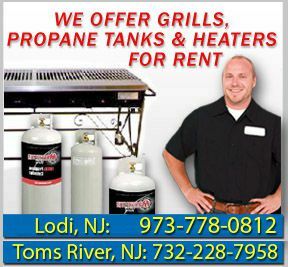 For more information about our Propane Refill For Propane Heater in NJ or services we provide at Modern Propane, call us at our Lodi BBQ store: (973) 778-0812, our Toms River BBQ store: (732) 228-7958, or visit us at either location.